“This summer holiday season will not be the most promising for the tourism industry in Quintana Roo, because in the months of July and August it is expected that the massive arrival of sargassum will continue to affect the shores of Cancun, Playa del Carmen, Riviera Maya and Tulum”, said Samaria Angulo Sala, municipal president. “We had a thousand tons in a weekend, which is what we have regularly in a month, and what we see is that the months of July and August are expected to impact us more, so we are trying to figure out how to deal with the situation, “he said. Government officials held meetings between June 20 and 23, to analyze the problem of the seaweed, that is arriving in an average of 30 tons per day, which adds for almost 1,000 tons per month. 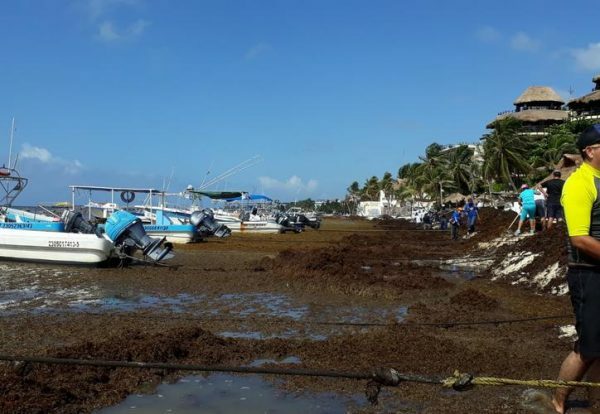 Due to the intense presence of sargasso, the 62 million pesos that the Federation gave Quintana Roo to face the rains, was decided to be used to fight sargassum, but to date no plan has been announced, despite that the summer season has already started and tourism is expected to be significantly affected by this situation. However, Angulo Sala said that “there are as many cancellations as we expected because of sargassum, travelers understand that it is a matter of nature, but we have to work on looking for the best method to clean up the beaches without a negative impact on the ecosystem, and we are waiting to acquire special machinery that will allow us to deal with the situation without harming the environment”. Andrea Lotito, adviser to the Hotel Association of the Riviera Maya, said: “In these days what makes tourists uncomfortable is the sargassum, and is partly due to the idealistic image of white sandy beaches that travelers expect to see” she said.